Secretary of Defense James Mattis said Aug. 7 that peace talks are underway to end the 17-year-old war in Afghanistan. Defense Secretary Jim Mattis seems to have reversed course on his previous stance against a Space Force, telling reporters Aug. 7 that the Defense Department is supportive of establishing a new combatant command for space. Raytheon and a Lockheed Martin-Dynetics team are now locked in a head-to-head battle to build a powerful 100-kilowatt laser for the U.S. Army, pushing the envelope on directed-energy capability development. Aerojet Rocketdyne successfully completed two hot-fire tests of a rocket motor designed to boost an air-launched tactical glide hypersonic vehicle during its initial phase of flight. The U.S. Air Force has selected Lockheed Martin to rapidly develop and field both new hypersonic missiles launched as a response to surprise developments in high-speed weapons by China and Russia, newly-released acquisition documents confirm. Raytheon has built a new massive radar development facility — complete with robotic helpers — to assemble and test its newest radars, but the facility’s design will take the company’s radar work well into the future. The Japanese Ministry of Defense’s Acquisition, Technology & Logistics Agency (ATLA) released video footage on 31 July showing a small-caliber developmental electromagnetic (EM) railgun along with related support and test equipment. The KC-46 is (hopefully) almost here, and that means the Air Force needs pilots to fly the refueling tanker when it arrives. 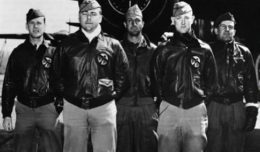 A military agency says the correct remains of a Gage County, Nebraska, man who died when his aircraft was shot down during World War II are being returned home for burial.